Business Case: The business requirement is to attach any document while doing the goods receipt for material. The attachments can be any reference documents or image or any other document related to goods receipt of the material. To meet this requirement SAP has provided a tool bar called ‘Generic Service Toolbar'(GOS). Now a days since we are using mobile application so there is a requirement to create a attachment for existing Material document through Net-weaver Gateway. We can able to upload any document (PDF/DOC/JPG/XLS) and through OData service the document will be linked to the corresponding Material document. 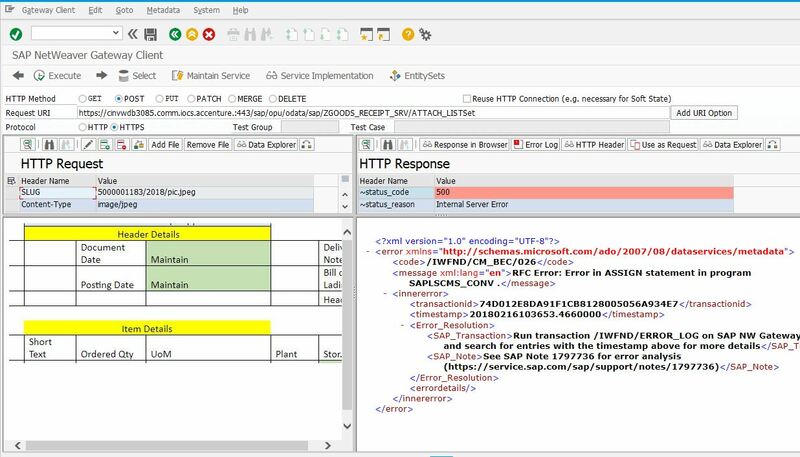 The below are steps required to create an OData service in SAP NW Gateway. Step-1: Create a project for Attachment using SEGW transaction. Step-2: Create an Entity type, Entity sets. Remember the entity type should be defined as a Media type. Step-3: Create a property for the Entity type. Step-4: Generate the project. It should create all the back end classes for MPC, MPC_EXT, DPC and DPC_EXT. Now go to DPC_EXT class and redefine the method /IWBEP/IF_MGW_APPL_SRV_RUNTIME~CREATE_STREAM. 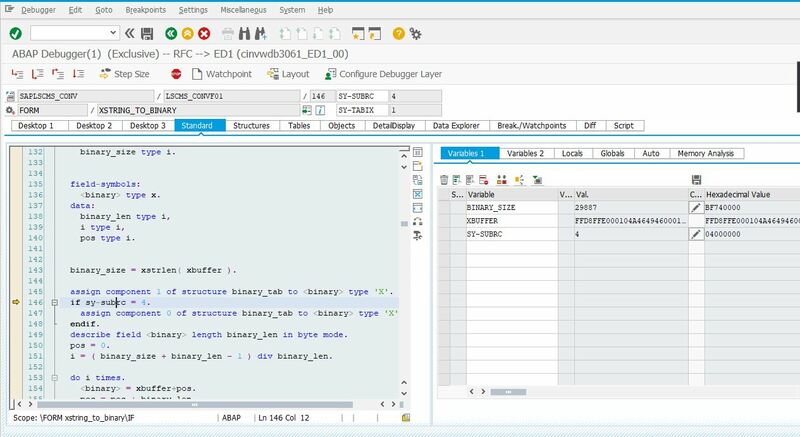 then upload the binary data into SAP. CONSTANT: lc_hex_null TYPE x LENGTH 1 VALUE ’20’. SPLIT iv_slug AT ‘/’ INTO lv_mblnr lv_mjahr lv_file_des. SPLIT lv_file_des AT ‘.’ INTO lv_tmp_fn lv_extension. CONCATENATE lv_mblnr lv_mjahr INTO lv_objkey. TRANSLATE ls_obj_data–file_ext TO UPPER CASE. lv_size = xstrlen( is_media_resource–value ). lv_offset = lv_offset + 255.
lv_temp_len = xstrlen( is_media_resource–value+lv_offset_old ). CLEAR ls_xdata–line WITH lc_hex_null IN BYTE MODE. IF sy–subrc = 0 AND ls_object–objkey IS NOT INITIAL. pass the Material Document number, Year and File name separated by ‘/’. Now click on execute. While executing please keep in mind that the HTTP method “POST” must be selected. Step-6: After execution of the OData service go to the transaction MIGO and provide the Material document number and year. you can able to see the attachment. As i see in your document you have used ‘Add file ‘ feature to get the content of the image (Media resourse- value) but in my case image will be uploaded from SAP UI5 how would i get XString to gateway and pass to Create_stream method ? ..can i pass xstring in slug Parameters as key? My project requirement is to add attachments by using the material document number. I am passing the matdocno/matyr/filename in the SLUG and the contents as well. But it is giving me the following error.